We slept fairly late. Getting ready to go, we caught a taxi from the hotel to the Parkway Deli. 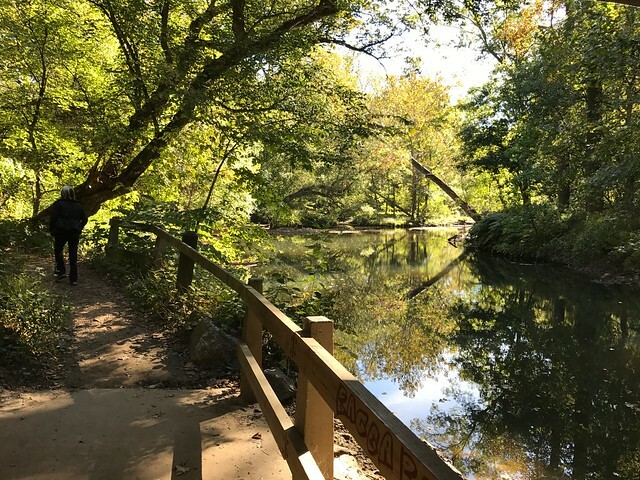 When we were here in August for the move-in weekend, Sharon had come across a magazine about a hike along Rock Creek Park. Starting at the Parkway Deli, the hike was supposed to cover seven miles to Pierce Mill. After having breakfast at Parkway Deli, we started off. The first half of the hike was very cool. The trail followed along the creek and you couldn't see the road. After a quick stop at the Joaquin Miller Cabin about the 4.0 mark, we did a loop round the Nature Center past Fort Debussy. The section after the loop was on the hillside above the road. It was also a rougher trail with lots of roots and rocks. Eventually, we got to Pierce Mill. In total, we hiked more than 8.5 miles. A map of the hike is here. We caught an UberXL from Prence Mill into Georgetown. Looking for somewhere to have a late lunch, we ended up at the Sovereign. We had seen this place when we were here for the move-in weekend. It is a Belgium themed bar and restaurant. Jack met us there. The three of us split an order of Mussels (Saffron - fennel, smoked sausage, red pepper, roasted garlic). Afterwards, we walked back to the campus with Jack. We picked up our parent's weekend package in the Healy Family Student Center. Standing outside his dorm, we ran into his roommate George and his parents. We had gotten to know George's parents a little during the move-in weekend. All of us headed to the dorm room. George plays club ice hockey and had games on Friday and Saturday night. Eventually, Sharon and I walked with Jack to the library. He has several midterms early next week and wandered off to study. Sharon and I took a taxi back to the hotel. Getting cleaned up, we had a drink in the hotel bar and then walked to the Kennedy Center. As part of the parent's weekend program, we bought tickets to Cirque de la Symphonie: Halloween Extravaganza. The program combined jugglers, aerialists, contortionists and strongmen with Halloween themed music by the National Symphony Orchestra. I was pleasantly surprised. It was a very engaging performance. Sharon and I also enjoyed getting a chance to see the venue. Built in 1971, the Kennedy Center houses three main theaters: the Concert Hall (2,422 seats), the Opera House (2,300 seats), and the Eisenhower Theater (1,163 seats). The place is huge! We caught a taxi back to the hotel after the show. We ended up splitting a burger in the Westend Bistro in the hotel. We finished the night watching Jon Hamm on the Tonight Show with Jimmy Fallon.